As the next post in our series The Guide to Cloth, we have put together a glossary of cloth-related terms, covering everything from different animal fibres and their properties, to the various stages of spinning and finishing. This took a lot of work to put together, but of course is still far from complete – please do suggest any other terms you would like included. We are also working on a more in-depth illustration of weaving styles – feedback on imagery taken on board! Alpaca – A camelid species (Vicugna pacos) that resembles a smaller version of a llama. The alpaca has been successfully domesticated for thousands of years, and only a few wild herds remain. Alpaca fibres in general contain fewer microscopic scales than sheep’s wool, which give them a smooth feel, and natural waterproofing. Unlike sheep’s wool, alpaca fibres are free of oil, and are therefore hypoallergenic. They also possess a high tensile strength, but like most camelids have difficulty taking dyes. The average fibre diameter is between 18-25µ, though this depends on the breed, of which there are two – Huacaya and Suri. Bias – An oblique direction to the warp and weft of the cloth; true bias is judged at 45 degrees. Birdseye – A spot-like micro-design for worsted wool. Named (obviously) after the shape of a bird’s eye. Normally two different shades of yarn are used to create a clear contrast, but the same shade can be used for more subtle cloths. Blankets – Before full-scale production of any cloth begins, a special loom creates several experimental patterns called blankets. This allows a designer to try new techniques and designs on a small scale, rather than having to create a whole cloth each time. Camel – Camel hair is the most commonly used term for the fibres that come from the two-humped Bactrain camel (Camelus bactrianus). Bactrian camels will shed much of their winter coat in the summer months, but are mostly shaved today. Each camel can produce several kilograms of hair, which are still often collected by hand. Camel fibres are very beautiful, and are often left undyed in their natural caramel colour. Alongside the pleasingly rugged feel, this shade has become one the hallmarks of the textile, and is much appreciated in outerwear and jackets. The fibres are surprisingly fine, measuring between 16-18μ, yet a heavy weight means that they are very warm. The length of the fibres ranges from 25 up to 130mm, and they possess exceptional elasticity. Canvas – A closely woven fabric used as an interlining in jackets and coats. This can be made from cotton, flax, hemp, jute or man-made fibres. Cashmere – Wool from the Cashmere goat (Capra hircus langier), sometimes spelt Kashmir after its place of origin. The goats produce two distinct coats. One is a coarse outercoat, which protects the animal from wind and rain. The other is a soft undercoat, consisting of fine hairs that help to trap heat close to the animal’s body. It is the latter coat that produces the cashmere fibres we use. These coats are gathered simultaneously by shaving, or by picking them from plants the animals brush against. The separation of the fibres has to be done manually, which is a major reason it is such a rare and expensive fibre. The fibres are extremely soft, possess an excellent sheen, and are light to wear and trap heat close to the skin, making them ideal for accessories such as socks, scarves and gloves. Chest piece – A small piece of hair canvas and felt, which is sewn to the interlining in the chest area of the garment for strength and shape. Chinchilla – A squirrel-sized rodent, native to the Andes mountain region of South America. There are two species, the stocky Chinchilla chinchilla, and the large eared Chinchilla langiera. Both possess the silky platinum-coloured coat, but the micronage varies between species. The reason the coat is so soft is that the chinchilla grows about 65 hairs for every follicle (humans grow only one, if any). Such a dense covering acts as an impenetrable barrier, protecting the animal from bacteria, while also insulating it against the cold mountain conditions. Corduroy – A fabric with a pile; for corduroy this pile is grouped in ribs, which are normally vertical and alternate in width. The weave and pile are mainly made of cotton, giving the cloth comfortable wearing properties. These fabrics are often used for trousers or sport jackets, and their warmth makes them popular in winter. Cortex – A series of fibrous, spindle-shaped cells that form the interior of the fibre. These provide the fibre’s elasticity and resulting high tensile strength. Cotton – A vegetable fibre that grows to protect and disperse the seeds of the cotton plant (Gossypium). Cotton is particularly used for breathable cloths that are incredibly versatile and resistant to washing; a single fibre can be bent 50,000 times or more without breaking. The natural white colour and cellulose structure of the fibres means cotton retains moisture to nearly 25 times its own weight. This allows it to dye easily, and cloths can be found in any shade or pattern imaginable. Fibre length for most cotton is quite long at 2-5cm on average, and the diameter is relatively thick at 12-20μ. Crimp – Tiny bends in the wool, which not only give it a curly appearance, but also help to give cloth good resilience and insulation. Curtains – Lining material used on the inside of the waistband of tailored trousers. Doppione silk – Perhaps the most valued of all silk, only spun during the rare event when two larvae co-operate to create a single cocoon. As the fruit of a partnership this cloth is symbolic of marriage in many cultures, making it much sought after to create suits for weddings. Double-faced – A material that can be worn on either side. Drape – An adjective that describes the way cloth falls when hung. Draping quality varies with structure, composition and finish of the material. Dry finish – Finishing that doesn’t involve water. The fabric is dried to a certain width and then ‘raised’, where the surface of the cloth is brushed. This is important for cashmere and cloth crafted especially for overcoats. Ends – The warp yarns in a fabric. Epidermis – The outside of the wool fibre, which is coated in microscopic overlapping scales, allowing it to cling together and form felt under heat and pressure. Heat also becomes trapped between them easily, making it a good insulator. Face – The outside (or ‘right side’) of the fabric. This is visible when the garment is finished. Faced cloth – Cloth with a pile, or a nap. Facing – The fabric that forms the top covering of the lapel on a jacket or coat, and which usually folds to the inside of the garment from the top buttonhole. The lining inside the jacket is attached to the facings. On a dinner jacket or tuxedo, the facing may be silk. Faille – A type of fabric based on a plain weave: the difference of density of the yarn (higher in warp than weft, so more ends/inch compared to picks/inch) and the different yarn counts (finer in warp than weft) create a ribbed effect. Fibre – Though the individual composition of cloths can vary greatly, the raw ingredients are drawn from only two areas of the natural world – the coats of animals, or plant fibres. Depending on the type of cloth desired, these fibres can be processed, spun, blended, and woven in many different ways, but arguably the most important choice is always the parent species. Fibre dyeing – The individual immersion of fibres in ink or colouring. This is the most economical way of colouring fabrics, but it carries the greatest risk of disruption due to the friction of weaving, and is harder to uniformly match the individual fibres. Fine drawing – Invisible mending to repair faults in a fabric. Fine wool – Wool with an average micron of 18.6µ and upwards. Fineness – The diameter or thinness of the individual fibres. It is generally styled as micron, micronage, or μ. Finished cloth – Cloth that has been treated after its initial manufacture to make it suitable for intended end-use; such as bleaching, dyeing, shrinking, or adding easy-care properties. Finishing – Arguably the most important stage of the cloth making process, as it is here that collections are often given their most distinctive attributes. Cloth fresh from the loom is known as ‘grey goods’ to signify it is still raw. There are many different types of finishing, with dyeing only one. Before a cloth can be dyed or conditioned it must first be treated. A typical treatment will clean the fabric and stretch the cloth to its proper width. Entering – Stretching the cloth in a heated chamber. This sets the proper width of the cloth, ensuring that it will take dye and later treatments in a uniform way. Napping – Napping involves brushing and teasing to raise the surface of a cloth. It affects the weft yarns more than the warp, as these are often tighter. This is used to create corduroys and velvets. Shearing – Shearing involves cutting down the nap of a fabric to a predetermined length. It was once commonplace, but today has been largely replaced by singeing, although velvet is occasionally still sheared depending on the final look desired. Singeing – A process that passes the cloth over heated plates, resulting in any residue or fuzz that has attached itself during weaving being burnt off. This makes cloths such as cottons smooth to the touch and easier to tailor. Calendaring – At its most basic this is a form of ironing, which sets and smooths the cloth between two heavy heated presses. This also adds a nice sheen to many cloths due to the heat involved. Embossed and moiré cloths use this stage to stamp patterns into the cloth. Shrinking – Some cloths, especially cottons and wool, may be shrunk to provide a tighter weave and the resulting addition of strength. This is done very carefully, as any errors can result in the cloth being ruined. Fulling – Wool cloths are pounded and worked in warm water, making the fibres interlock even more closely. Scouring – This removes any impurities in wool, by washing and stretching the cloth in warm water. Fusible interlining – An interlining that has been treated so it adheres to other fabrics via the application of heat and pressure. Gabardine – A derivation of a twill weave. It creates diagonal stripes on the face of the cloth. The construction of the cloth is very tight, so it is often used for trousers. Glaze – A term describing the finish of a cloth with a smooth, high-polished surface. This is obtained by means of friction during calendaring; can also refer to a shiny mark obtained by excessively hot ironing or bad pressing. Gloss – A deliberate shine on fabric obtained after pressing, usually caused by heat and pressure in the areas of extra thickness such as pockets and seams. Grain – The direction of the warp of the fabric that runs up and down its length. A garment would normally be cut on the grain. Cross grain is cutting a garment across the grain. Off grain is cutting the garment on the bias. The grain line is marked on each pattern piece to ensure the correct direction of the grain. Guanaco – The fibre taken from the undercoat of the guanaco camelid (Lama guanicoe). Genetically they are cousins of the vicuña, and inhabit the same high Andean plains in South America. Unlike the vicuña, these animals have been domesticated successfully, although numbers have depleted to only 500,000. The natural colour is a creamy white, and each fibre is covered with miniscule scales that capture hot air while repelling moisture. This makes them notoriously tricky to dye, and due to the difficulty of procuring sufficient amounts, guanaco is most often blended with other fibres in its natural colour. The length of the fibres is on average between 20-25mm, and they are very fine at only 16-18μ. Haircloth – A springy, wiry fabric used to interline and strengthen a jacket or coat in the chest area. It has cotton or linen warp, and a weft of horsehair. Handle – The feeling fabric has in your hand. Heat Setting – Stabilisation of fibres, yarns and threads with heat. Herringbone – A modified twill weave. The diagonal structure of the twill changes its direction after a constant number of warp threads. The result is a zig-zag effect, which looks a little bit like the skeleton of the herring, hence the name. Hopsack – A modification of a plain weave, in which two threads in warp are followed by two threads in weft. This creates the appearance of small cubes. This type of weave is very popular in jacketings, but can sometimes be seen in suitings and outerwear. Interlining (interfacing) – A layer of fabric inserted between the front and the lining of a jacket and coat. This gives stability, shape-retention and strength. The interlining can be sewn in or bonded by heat. Irish linen – Traditional Irish linen is heavier than most other varieties, and must be produced from 100% European fibres. These are often imported from Belgium, which is known as the world’s best flax producer. Jacquard – To create intricate patterns or special designs, a jacquard loom is used. This can have many different feeds for both warp and weft, and requires constant monitoring. Jet/jetting – A narrow strip of fabric that is usually cut on the warp, then sewn parallel to the pocket opening and turned over to form the pocket-mouth edge. Kapok – A fibre derived from the tropical tree of the same name (Ceiba pentandra). Shaped like a giant nut, the fruit of the kapok contain silky threads that help seeds float on the wind; the tree is therefore endemic to any continent that can support it. These fibres are so fine that they have not been possible to spin until recently, and new weaving techniques are used to create suitings with greater durability than cotton. Lanolin – In its natural state, wool is coated in oil called lanolin, which creates a waterproof barrier for the sheep. Lanolin-covered wool is known as ‘greasy wool’, and this is removed through the process known as ‘scouring’. Linen – A vegetable fibre taken from the flax plant (Linum usiltatissium). Flax requires constant attention during cultivation, and the fibres do not stretch, making weaving difficult. Linen is renowned for its cooling properties; garments and cloth remain cool to the touch under even the most intense heat, as its unique cell structure allows it to conduct heat away from the body. The fibres can also absorb moisture very easily. This means that humidity and perspiration are carried away from the body, and evaporate quickly due to the cloth’s loose structure. Fibres are also very strong because of their low elasticity; this allows garments to retain shape after wearing and washing, but also means that they can crease easily. Length – The length of the fibres is often measured in millimetres, centimetres, metres (but can be measured in inches and feet depending on the country). A general rule is that the longer the fibre, the finer the cloth (though this is not always the case). Ligne – A standard measure equal to one fortieth of an inch by which buttons and ribbings are measured. Thus, a 40 ligne button measures one inch in diameter. Lining – Material used for the inside of a garment. Medulla – The channel through which the fibre is nourished, and governs the good crimp and absorbency of fibres. Merino – A particularly fine wool, which originated in Spain. It provided the money that funded Columbus’ voyage to the Americas, and today accounts for a large part of Australia’s export economy. The world’s finest wool comes from these Australian merino sheep, and in particular the Saxon-Merino breed. Mink – There are two species of the semi-aquatic mustelid known as the mink; the American mink (Neovision vison), and the European mink (Mustela lutreola). The finest fibres come from the American variety, with the European mink’s pelt used only rarely. To keep the mink warm during aquatic adventures its fur fibres are extremely fine, measuring only 14-15μ. This enables the mink to glide smoothly through freezing water, but dry quickly. Mink fur is extremely resistant to moisture, which makes it hard to dye. Colour differences have therefore been purposefully bred. Mohair – Spun from the fleece of the Angora goat, not to be confused with ‘Angora wool’, which comes from the Angora rabbit. Angoras are shaved twice a year, with the summer shaving harvesting finer and softer fibres than those that have grown through the winter. The very best mohair comes from juvenile goats, and is, therefore, known as kid mohair. Mohair fibres are extremely soft and resilient, while also being insulating. They are very smooth, and lack the microscopic scales other organic fibres have, meaning that they reflect light, creating a sheen. Mohair is unique amongst fibres as it is valued not by its softness or fineness, but the lustre of its sheen. The wool becomes nearly white once scoured, and thus dyes very easily. Nap – A fibrous surface to the fabric that is raised from the basic structure. This may have a different feel to the touch, being rough in one direction and smooth in the other. Fabrics with a nap should be cut only in one direction, usually smooth for cashmere or camelhair, and rough for velvet and corduroy. Non-woven fabric – A fabric made by the bonding of fibres via chemical or mechanical means. Some under-collar fabrics are constructed in this way. Picks – The weft yarns in the fabric. Piece dyeing – Colouring the whole bolt of cloth at one time. This produces nearly perfect uniformity across the bolt, but minor differences between bolts can mean matching them is difficult. Piece-dyed fabrics are usually cut into length for tailors at one time to ensure the best uniformity. Pile – A surface effect on a fabric that stands proud from the body of the material. Usually associated with velvets, corduroys and cashmere over-coatings. Plain weave – The most basic type of weaving. Each horizontal weft thread is interlaced with each vertical warp thread by going over the first and under the second, over the third and so on. Because of such rigorous interlacing the plain weave is the most solid construction. The fabric can be very light and airy without sacrificing stability. Ply (fabric) – A single thickness or layer of fabric. Ply (thread) – An individual yarn in a thread. The number of plies in a thread is the number of yarns that are twisted together. Prunelle – A special kind of twill weave where one vertical warp thread goes over two but under only one horizontal weft thread. A common characteristic is that the face of the fabric looks different from the back, especially if different shades are used in warp and weft. Satins – Created when the weft is allowed to pass over multiple yarns. This creates a very smooth face, and a very rough back. Normally satins are heavier than plain weaves or twills, but they have a soft handle and excellent drape. Selvedge – The longitudinal edges of a fabric formed during the weaving process; usually the component threads are interlaced to prevent them from fraying or unravelling. Serging – Another term for overlocking, when the edges of the garment are neatened to prevent fraying. Sharkskin – Known as pick-and-pick in the UK, this is a design based on a 2/2 twill (although the same effect can be achieved on a 2/2 hopsack), with alternating colours in warp and weft. Shoulder pad – Shaped layers of cotton wadding or felt used to define the shoulder of the jacket. Silk – Secreted by the larvae of the mulberry silkworm (Bombyx mori). It is used to build cocoons, within which the insect grows into a moth. Silk is naturally very, very fine, and measures around 5-11μ in diameter depending on the species. In less than a week a single larvae can spin more than one mile of fibre, only breaking the filament every 800-1200 metres. Each fibre can absorb more than 30% of its own weight in moisture, while still feeling dry. The fibres are also poor conductors of heat, meaning silk remains cool to the touch at almost all times. The fibres reflect light to keep the moth cool during incubation, giving resistance against creasing and a sheen to finished cloth. Spinning – Spun fibres are called yarn, and the traditional instrument used is known as the distaff. The distaff used a hand-guided weight called a spindle to spin the fibres as they were drawn out vertically with the other hand. This was repeated several times, depending on how fine or strong a yarn was to be. The most common method is ring spinning, which involves high-speed spindles that rotate continuously. Blending – Different grades and types of fibre are blended together for different end uses. Picking and lapping – Lumps of fibre are broken up and cleaned, then gathered into laps or rolls. Carding – Laps of fibre are drawn over rotating cylinders fitted with tiny combs, which gradually straighten the fibres. These are then gathered into slivers. Combing – For finer yarns, the slivers are fed over other cylinders, which have thinner teeth. After this process, only fibres of the same length remain in the sliver. Roving – This draws out the sliver and twists it together, forming a rope like length called a roving. Spinning – The spinning process gradually turns the thick roving into fine yarns, which are then wound onto bobbins. Twisting/winding – Warp yarns require more strength, and so are twisted together with other yarns. Stay tape – A narrow strip of fabric, usually cotton or lined, which does not stretch and is used to strengthen or control various parts of the garment. Super – The Super system is a classification of diameter or fineness, and, for consumers, is perhaps the most commonly seen measurement. Superfine wool – The second finest wool available, mostly used in luxury products. The micronage must be 17.6-18.5µ. Swatch – A bunch or collection of sample cuttings of materials, used to indicate their representative characteristics. Trimmings – The component parts of a garment other than the main fabric. Twill – The twill’s characteristic diagonal appearance is created when a warp thread stretches over and under two or more weft threads. The most common is the 2-and-2 twill: 2 warp threads go over and then under 2 weft threads at a time; 3-and-3 twills, and sometimes even 4-and-4, can also be found. Twill fabrics offer great versatility and drape. μ – A measure of micronage, 1/1000th of a millimetre. The smaller the micronage, the finer the cloth feels. Ultrafine wool –The finest wool available toda;, it must be 16.0µ and finer. Undercollar – The part of the jacket collar which is under the main (top) collar. Only seen when the collar is turned up. Velvet – Velvet has a short pile of around 2 to 3 mm, and is mainly made of cotton. Velvets are in general very delicate and have to be treated very carefully to avoid damage. The pile of velvet, as well as that of corduroy, has a natural direction, which has to be taken into account during weaving and construction. Vicuna – The vicuña (Vicugna vicugna) is a small camelid that lives on the high Andes plains of South America. Their fleece is widely regarded as providing the best fibres in the natural world. The wool can only be collected from each animal once every three years, and the average yield is very small. Vicuña are impossible to keep in captivity, and none have been successfully domesticated. Coupled with a low population, this makes vicuña the world’s rarest fibre. Each fibre is covered in microscopic scales that trap hot air, which keeps the animal warm at high altitudes by keeping heat near the body. The fibres are also naturally waterproof, as moisture retention in such a cold environment would be detrimental. These properties make vicuña cloth an excellent insulator, but also mean that they are hard to dye. This means that most cloths will retain the cinnamon colour natural to the fibre. The fineness of the undercoat measures 10-12μ, with the average fibre length between 20-25mm. Wadding – A loose cohering mass of teased fibre used as padding, particularly in the shoulder pad and sleeve head of a jacket and coat. It is also used to ‘pad out’ an area of the garment to disguise any irregularity in the figure, for example a prominent shoulder blade. Warp – A series of longitudinal yarns (also called ends) in a woven material. Weaving – The interlacing of two yarns, at right angles to each other, often arranged into designs. This creates an unbroken sheet of cloth. During weaving the warp yarn is fed continuously onto a rotating drum, while the weft yarn is moved back and forth by a small shuttle; interlaced fibres are then compressed together by the loom’s reed. This process is repeated until the desired length of cloth is reached, sometimes several million times. Weft – A series of yarns (also called ends) interlaced across the warp of the fabric from selvedge to selvedge. Welt – A folded piece of material used to finish a raw edge. The best example is the outside breast pocket. Wet finish – Finishing that involves water. Elements include cropping, where the cloth is passed over a knife, and the raised fibres on the surface of the cloth are cut to an equal height. Then blowing or pressing, where the cloth is spun in a steam filled centrifuge. This consolidates the cloth and gives the final shrinkage. And finally a paper press, where the cloth is layered between electrically heated cardboard and metal, and placed under pressure for 24 hours, giving worsted cloths their smooth handle. Paper pressing has become very rare in the modern era, as it requires a large amount of preparation by hand. Wool – Though ‘wool’ can be used to indicate the protective covering of several animals, it most commonly refers to the sheep fleece. Woollen – A bulkier wool yarn, most commonly used in heavier jackets and coats. Its surface is characterised by a soft, fuzzy and uneven appearance. This occurs as a result of undergoing only the carding process, without the smoothing that comes from combing. Worsted – Wool that is both carded and combed, creating a finer, harder yarn by making fibre lengths uniform. Worsted cloths are traditionally smoother and shinier than woollen ones; they may also feel lighter to wear. Yarn dyeing – Colouring the freshly spun fibres together. This is more expensive and carries less of a risk because all the fibres are dyed uniformly. You can follow the discussion on The A-Z of cloth by entering your email address in the box below. You will then receive an email every time a new comment is added. These will also contain a link to a page where you can stop the alerts, and remove all of your related data from the site. Impressive work. Thank you ! Thank you for this wonderful start on fabric information. I did notice one probable mistake in the definition of “stay tape” — “lined” should almost certainly be “linen.” Cheers! Very comprehensive and thorough guide! Many thanks. Just one tiny suggestion: maybe you could add a new entry ‘felt’ or at least insert as an example of ‘non-woven fabric’. Perhaps you could add terms like barathea (a type of weave, right? ), barleycorn, herringbone, loden, cavalry twill, seersucker, moleskin, bedford cord, donegal…? Oh dear, yes there are many more. We shall build them all in. A separate post I think, as mentioned, on all the different weaves. Hi Simon, which suit fabric would you recommend if im looking for something that doesnt crease too easily? A high-twist fabric would be good, particularly for warmer months. Also slightly heavier worsteds. Probably the clearest definition of worsted that I have come across! Technically interesting but of no practical use at all. Ask your tailor if you should go with Lesser or Bateman, and he will not make a recommendation based on the degree of carding or combing involved in the manufacture. And when somebody asks your advice on fabric that doesn’t crease you suggest high twist; this doesn’t feature in your glossary. Thanks. Actually in my experience tailors will rely on rather outdated assumptions about different bunches – such as the Lesser predictability and time allowed for shrinkage. This is no longer a real difference between worsteds, but tailors simply stick with what they know. And in fact this is a technical difference, is not just one they can put into words. High twist is not included, and will go on the list. I’m sure you’ll appreciate that it is already long and we plan to add to it gradually to create a full list. Not sure I agree that most tailors rely on outdated assumptions. If I’ve asked about a particular cloth the answer I often get is based on their experience of how well it has made up, or feedback from their other customers about how well it has worn etc. I’ve never heard a tailor talk about microns, carding etc. To an extent that was my point. They don’t talk in those terms – they go on what they know works well and rarely deviate from it, because they want consistency. This also means they rarely try different things and explore how other cloths or mills are changing, which is why sometimes their experiences can be outdated. Fantastic guide! I noticed you labelled faille and sharkskin as satin weaves. I was under the impression that faille is a plain weave like other ribbed cloths such as grosgrain and bengaline. My sharkskin suits are woven in 2×2 twill weaves with alternating the colour of every other yarn in both the warp and the weft for a step effect, though I have seen a special sharkskin weave that I still don’t believe is a satin weave but looks more like an uneven twill. What am I misunderstanding? Good question Matt, I will hand this on to a mill contact and get back to you. I’ve got a suit made from bamboo! It’s very light and soft, and comfortable in hot weather, but I have no idea how well it will last! Bit of a novelty though. 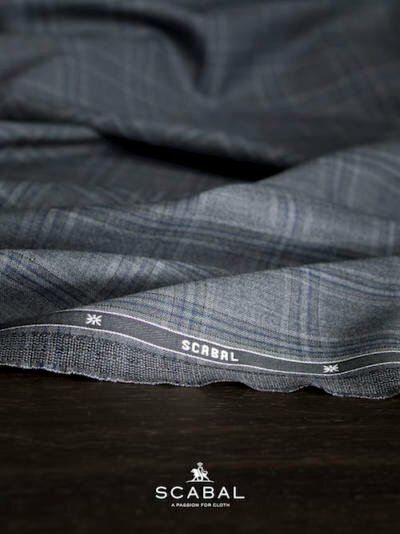 Hey Matt – you were right, this was a mis-entry from Scabal. Thanks for the catch, I’ll change it now. Might be worth investigation purely as an intellectual exercise! I almost never see you use them yourself? I know this is of topic, but anyways. Also, good work on this comprehensive guide to cloth. Really appreciated! I am currently considering commissioning four business suits (two double-breasted and two three-pieces). As of right now, the only two options I am certain about are a double-breasted Cifonelli suit and a three-piece Kiton suit. What would you suggest for the remaining two pieces? I was thinking one Savile Row tailor for the second double-breasted (either Anderson & Sheppard or Chittleborough & Morgan) and another Italian tailor (Rubinacci, A. or F. Caraceni or Solito perhaps?) for the last, three-piece suit. It sounds like what you’re aiming for is variety. If that’s the case, I would suggest the other two should be Caraceni (different to the Kiton in not being Neapolitan) and then whichever of the C&M or A&S style you most like. Thank you very much for your answer Simon. I was thinking about Rubinacci simply because his London atelier is a stone’s throw away from where I live. Do you think a Caraceni suit, whether A. or F., is so much better in terms of details, fit, and workmanship to warrant the three trips to Italy? It’s just different in terms of style, at least far more than any difference in quality of work. I visited a tailor today to order a new dinner suit, I was looking at either cloth with a super/mohair mix or a plain barathea. I am always a bit wary of super numbers. Is this justified? What would your advice be? Well done Simon, and so apropos, as there is so much evolution in cloth that needs to be talked about. Speaking of camel, it would perhaps be interesting to note how the finest camelhair has now been treated to become a perfect suit cloth. This new family of fabrics (named gobigold) has been developed by Loro Piana exclusively for Caruso and it now includes also a summer version, mixing camelhair with linen, and even a camel velvet (!). I think it’s worth knowing, given its radical novelty. Yes, Trunk it had last season, it was lovely…. I’m looking for a fall/winter equivalent cloth for trousers like the spring/summer workhorse chino. It should be also machine washable and available in lighter colors as well. I’ve got some (I suppose) thicker twill trousers for fall/winter and a few flannel trousers, which can be combined with jackets. The latter have the drawback, that this flannel has to be always dry cleaned. Maybe this applies to all wool cloths? Which cloth would you suggest? You’re pretty much stuck with heavier cottons, like those twills. But dry cleaning isn’t so bad – just brush wool every now and then, and press too. Steam does a lot of cleaning too. Did you consciously omit moleskin? I just saw above that poster Burt already mentiond moleskin in his list. Sorry. – The reason why I am moleskin conscious is because I must return two needlecord trousers and due to colour and size availability will request mpleskin in exchange, so I wanted your opinion on moleskin. I have one in blue, but it’s so limpy. However, I think those offered now are improved. I’ll try “pink” which are deep bluish red.